and the 2019 ordering season! Peonies are known as the most beautiful flower in the garden--a must have for every garden! Here at Oh My Peonies we've been enjoying peonies for years! I planted my first peony when my sister shared Red Charm with me. My reaction was "Oh My, Peonies!" Since then my hobby has grown to over 190 peony varieties. This year we've added more than 30 peony varieties from our garden that we are making available to you.. Some additions include Bob, Chinook, Chocolate Soldier, Circus Circus, Coral 'N Gold, Emma Klehm, Etched Salmon, Faithful Dream, First Arrival, Hot Chocolate, Kopper Kettle, Largo, Lavendar Princess, Lollipop, Matador's Robe, May Lilac, Monsieur Jules Elie, Mrs. Franklin D. Roosevelt, Myrtle Gentry, Nosegay, Pastel Splendor, Pastelegance, Pillow Talk, Pink Luau, Raspberry Sundae, Sarah Bernhardt, Scarlet O'Hara, Shining Light, Shirley Temple, Star Power, The Mackinac Grand and Topeka Garnet. We hope you enjoy this added selection of herbaceous and ITOH or intersectional peonies. Our peonies are shipped as bareroot peonies to you in the fall just in time for fall planting, so you may want to just reserve a spot in your garden to plant your new varieties in fall. Place your orders early since we have a limited supply of each variety. Orders are processed on a first-come, first-served basis so the earlier in the year you place your order, you are guaranteed your variety will be available. We WILL NOT substitute a variety without prior permission from you. Orders will be shipped mid-September through the end of October. I love sharing the beauty of peonies with people in my hometown. We've enjoyed the past couple of years of reaching out and sharing homegrown peonies with peony lovers and those who want to be peony lovers. 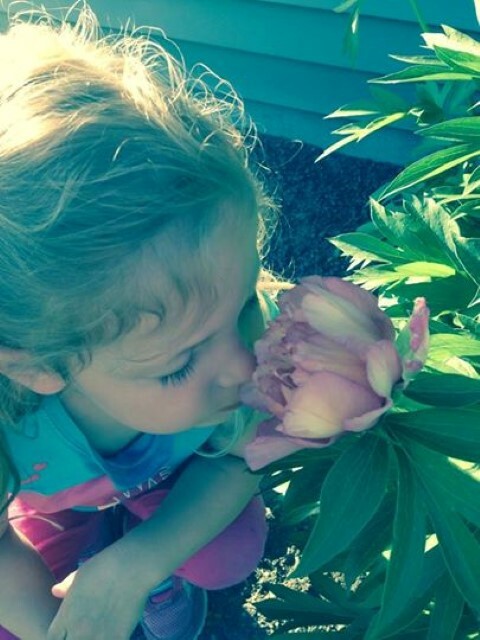 You won't be disappointed in the beauty our peonies bring to your own backyard!